As we approach the end of winter and begin to rewire our well-earned “Snowmaggedon Posture,” we’re targeting the Trapezius Muscles. 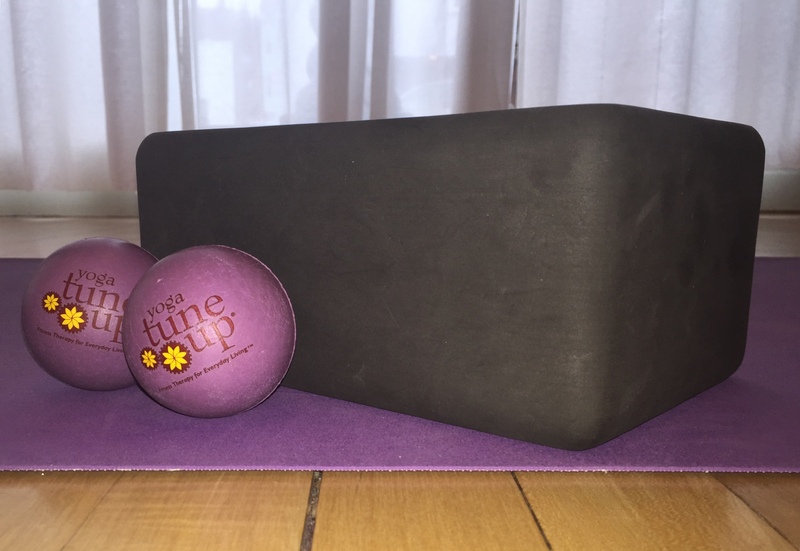 Try this fascial release pose to create happy tissue in a tight neck, shoulder, and back. The trapezius muscle is a “hotspot” located between the neck and outer shoulder, and the back and front of the body. We’ll begin on the part of the trap where you see the ball placed, above. Before entering each part of the body, take a moment to connect. You can place your palm on the area you’re about to enter, or simply direct your breath there. This helps “prime” the tissue, and also promotes the ability to listen to the tissue and dial in just the right amount of stimulation in any part of the body and, also enables us to adjust the amount of sensation in any part from one day to the next so we can be exquisitely responsive to the changing needs of these areas. Lie on your back with your knees bent. 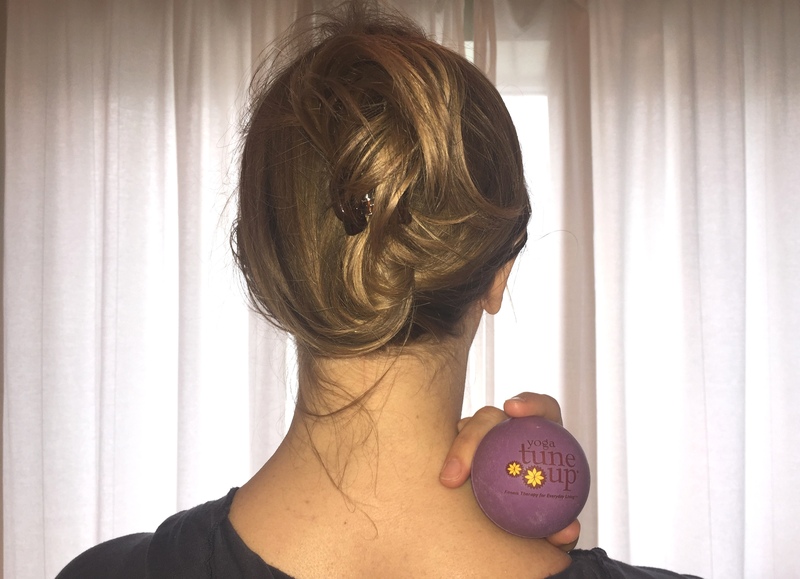 Place one ball on either trapezius muscle (you can also try both, but doing one at a time allows for more focus). Lie as you are and take several rounds of deep breath. If sensation is too strong here, consider padding the ball with a sock, or using a hollow ball. To increase sensation, lift your hips into bridge pose (you can place a block under your sacrum so the hamstrings remain relaxed). Breathe here for a few minutes, moving your body around slowly to help release the traps on all sides. When this feels complete to your body, remove the ball and enjoy a mini-savasana to let your brain assimilate the pose. Repeat on the other side. Reminder: Welcome thoughts, emotions, and impulses as a natural part of your practice. Acknowledge them as you breathe in, and release them as you breathe out. When doing connective tissue release, listen to the body’s response: less is more. If it’s difficult to breathe deeply, or the body is contracting “against” the stimulation, it’s a sign that the pressure’s too much. By reducing the amount of sensation, we can promote more release, not less. If you are using this pose therapeutically to process a difficult emotional experience, choose that emotion (you’ll find that your emotion usually has anger, fear, or sadness at its root). Hold the intention to simply be present with that emotion without trying to transform it, and without moving into the mental “story” that usually accompanies it. To keep your nervous system calm during this exercise, try 1:2 breathing, in which your exhale is twice as long as your inhale. If this is challenging, just allow your exhale to be a little longer than your inhale, or breathe in and out through your nose at whatever ratio works best for you.